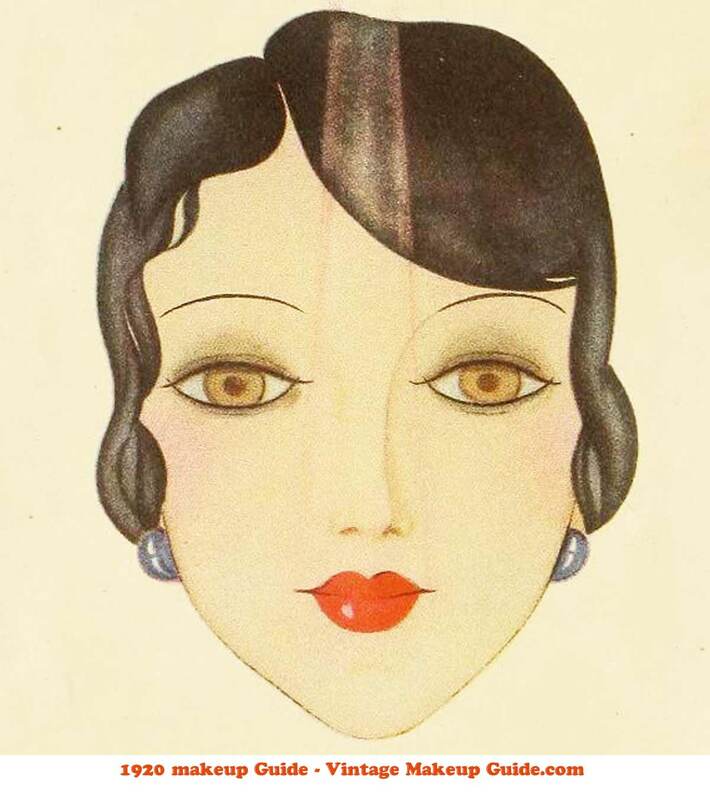 The appropriately named “Miss Dare” dishes out makeup advice to flappers “make-up moods” and “occasion make-up”and “Make-up to Hollywood types”. Remember that most womens faces are their own fault ! They want to be beautiful, yet they so often allow themselves to be limited by what they think they were born with. They don’t realize that beauty is a flexible thing. 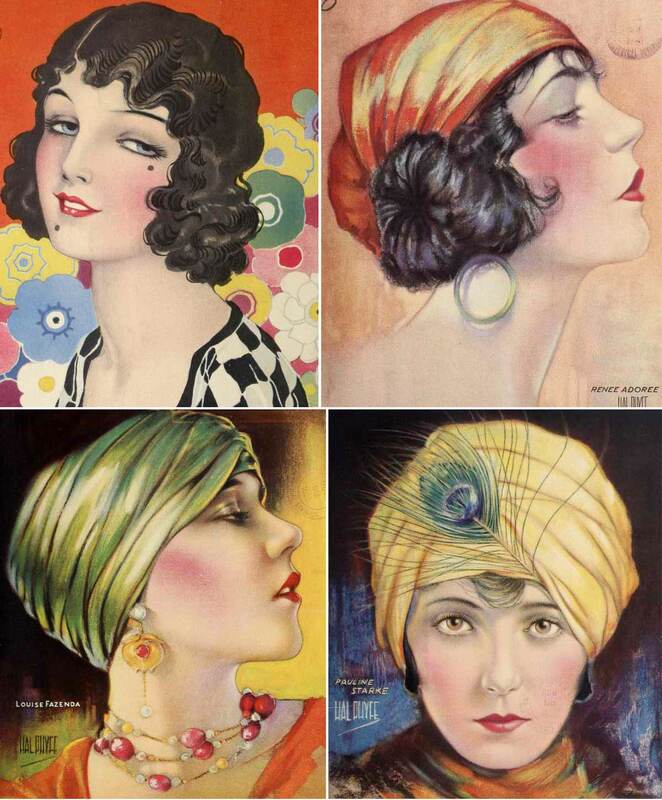 They look sigh-fully at Colleen Moore, Norma Shearer, Gloria Swanson or Corinne Griffith, and then go right on doing their own hair and make-up the same way they always have done. Sit down and study not just your face, but what’s behind it. Don’t be satisfied with making up just once before you go out for the evening; do it three times perhaps, so that you can be sure which shade of powder goes best with the frock and stockings you want to wear, or with what mood you want to convey: which shade of rouge to use on your lips; does it match your shoes and how much of it should you use! Let’s suppose you are in between a blonde or brunette type. You will have your blonde moods and your brunette moods. You don’t claim to striking beauty – what girl does? . 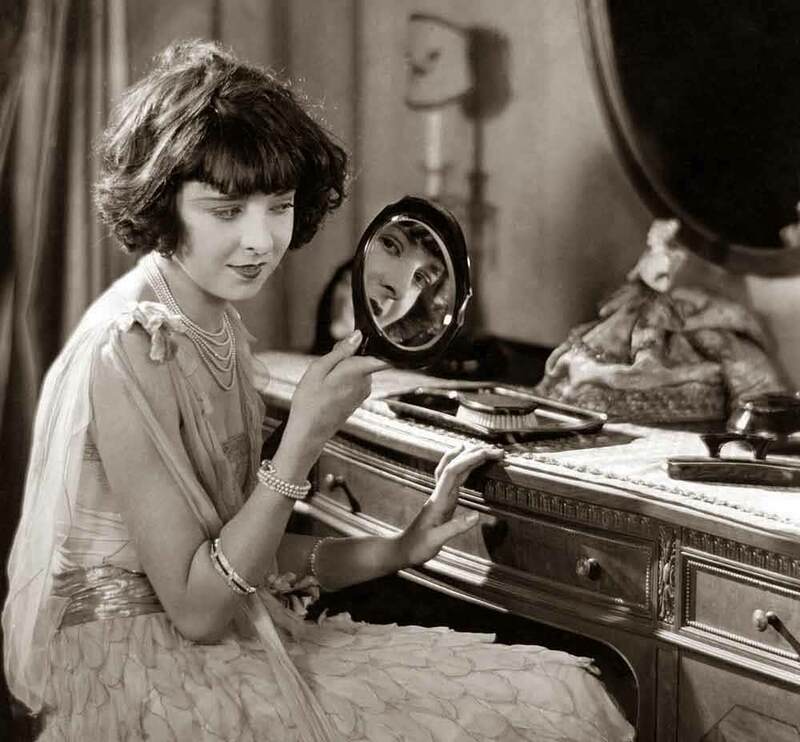 In temperament you’re the average sort of girl – neither a Pola Negri nor a Mary Pickford. 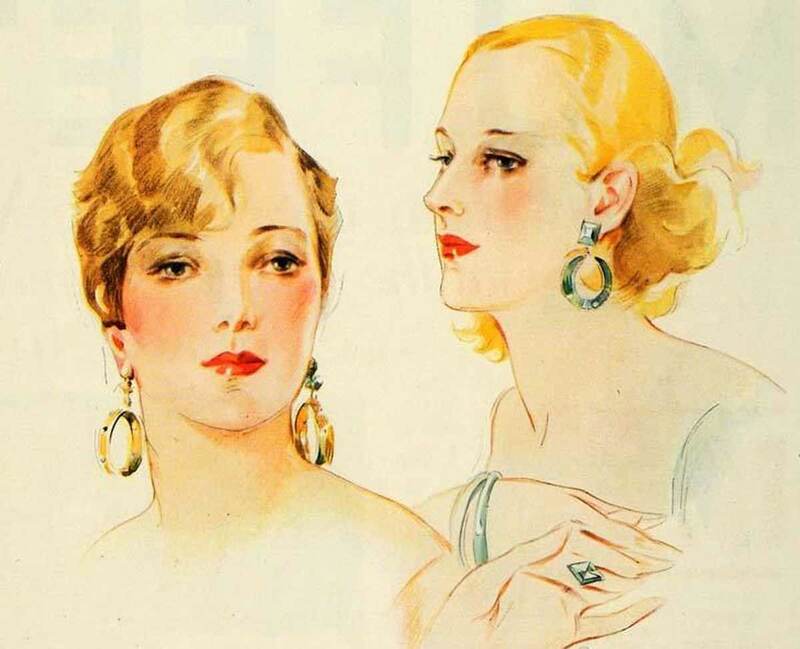 Your skin may be very white, like Pola’s – incidentally, nightly applications of a good bleaching cream will encourage this look – or you may have one of those in-between complexions. Whatever it is, the first thing for you to do is to find a powder that exactly matches it. This may be any one of three shades known as brunette, rachel, and flesh. Probably you will have to mix two of them to get the one that matches exactly. That one should be your stand-by. It’s best, when you mix powder, to use shades of the same brand – they have about the same consistency, and so blend more smoothly than two shades by different brands. Do the same thing with rouge. 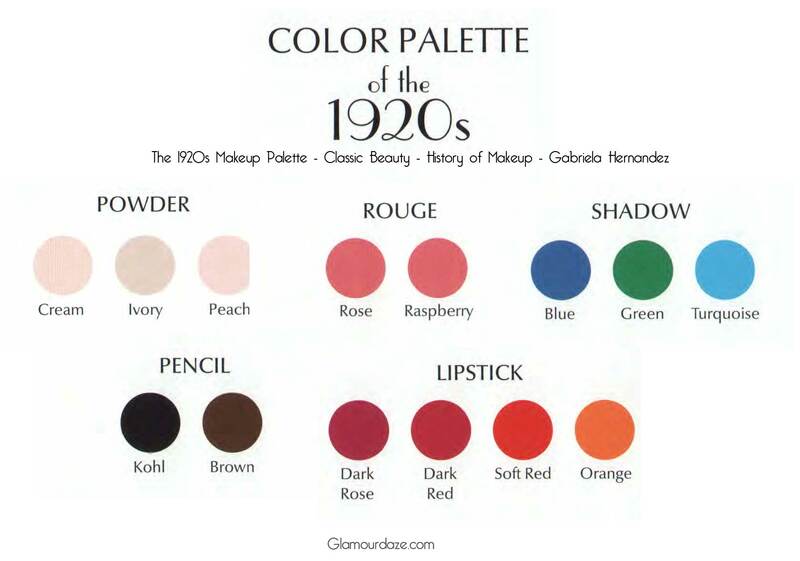 There are many different types of rouge now on the market, from sharp pinks that have yellow tints, to dark red that have tints of blue. if you use a cream rouge, you can blend two shades. Mascaro, for your lashes and eyebrows, can’t be mixed of course. You must choose between black and brown, according to your brows. 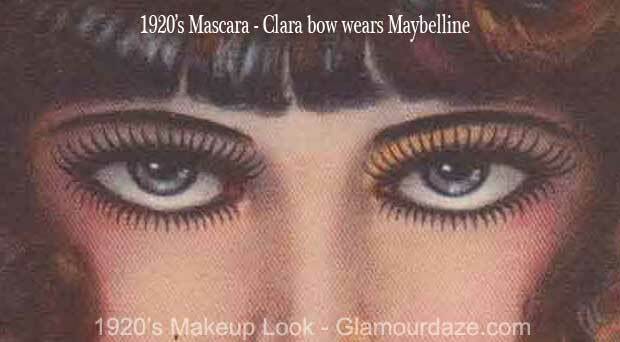 “Lining”, as the cream for eyelids is called, comes in blue and brown. The powder which can be used instead, comes in the same shades. Your powder should have a touch of flesh in it, instead of rachel. You should use black mascaro, if any, and blue “lining” – for the eyelids – very little of it if you are blonde. Now you may be the in between type that I’ve described, and have your blonde moods or your brunette moods. Then have two sets of make-up. 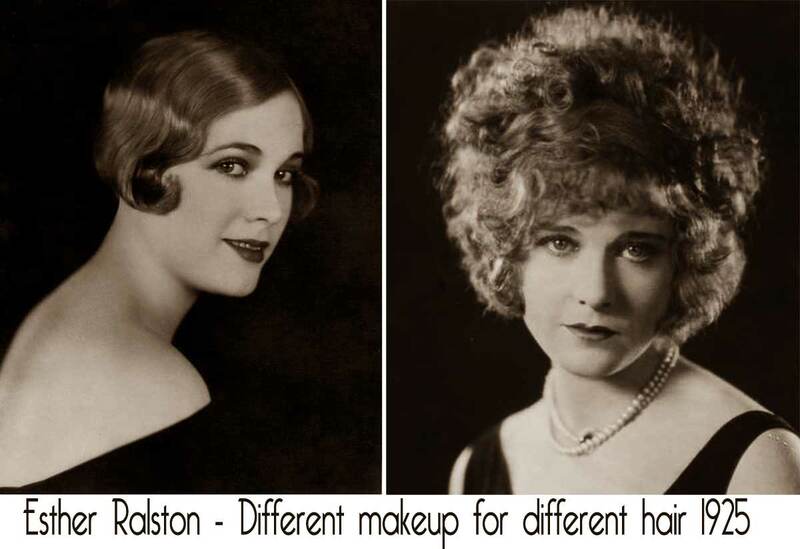 You’ll see in the pictures of Esther Ralston, how two different moods can be brought out from the same girl. It’s quite a dramatic difference isn’t it ! If you’re feeling frivolous, you shouldn’t use rouge that is all wrong for that mood. You can afford to use light rouges, even sharp pinks. You should have no make-up on your eyelids at all, no mascaro on your brows, very little on the lashes. Your lipstick should match your rouge, and you can afford to outline your lips rather sharply, even a Cupid’s bow, if nature hasn’t bestowed on upon you. When you’re inclined to being serious, don’t make-up to look frivolous as above. the effect would be like a slap in the face – the other persons, not yours of course! Use a soft rouge with red in it, and use enough of it to give your mouth some character. make up your eyes with brown shadows rather than blue; let these shadows be very delicate and soft, so that they deepen the color of your eyes. In applying cheek rouge, the general plan is to make a V, following the line of the cheek bone towards the nose, then back towards the ear. But of applied near the eyes, it makes them more brilliant than they would be otherwise, and not so soft and sympathetic. 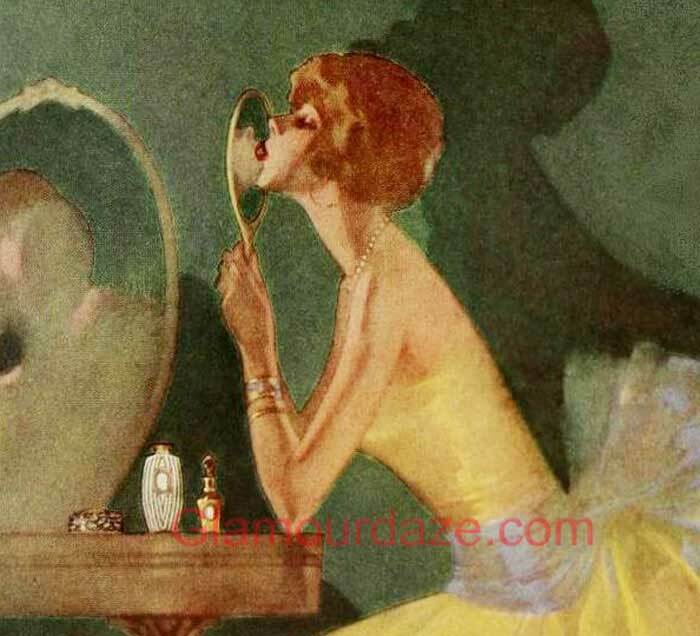 Let the contour of your face guide you in the use of your cheek rouge. Just as an actress makes up differently for close ups and for long shots, you should use a different make-up for big parties from what you normally might use for evenings at home. I know a girl who complains that she always looks nice in her own home but at parties, her looks have gone before the drinks are even served. Well I did not entirely agree with her, but she still dragged me into the ladies to do a quick make-over on her. So using my adage that you want to look as nice from across the room as you do under closer inspection, I used grease rouge ( which only cream can remove) and I accented the brightness of her pretty eyes with a good lash of mascaro. I then did a quick brush of “indigo blue” on her eyelids and feathered this outwards to enlarge her eyes. Why blue? 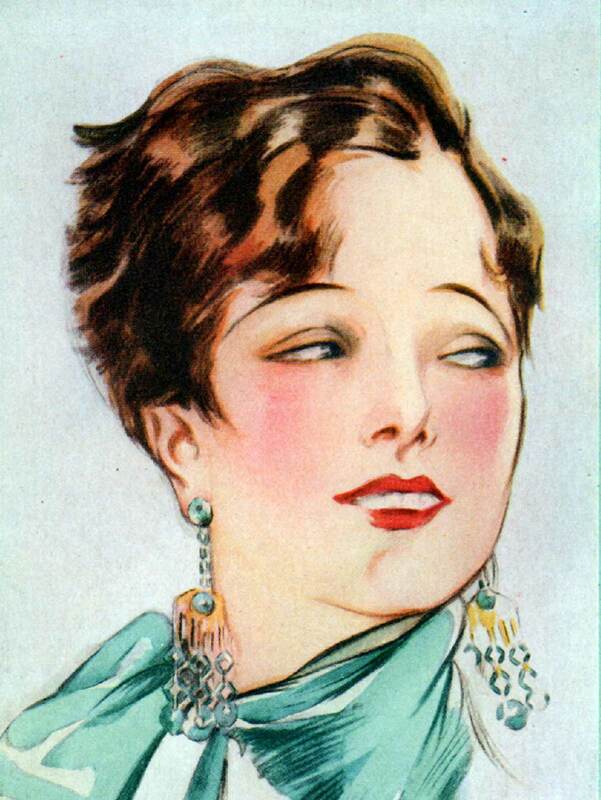 Well browns deepen a girls eyes, and unless you intend to appear anti-social, I recommend a vivacious color like blue to draw admiring glances towards you, and strongly lined lips, preferably with a pronounced cupids bow. Another girlfriend of mine turns heads everywhere she goes. She is not conventionally beautiful at all, but her secret is to wear extreme styles of clothes, hairstyle and make-up. In other wards you simply cannot miss her as she swishes by you. 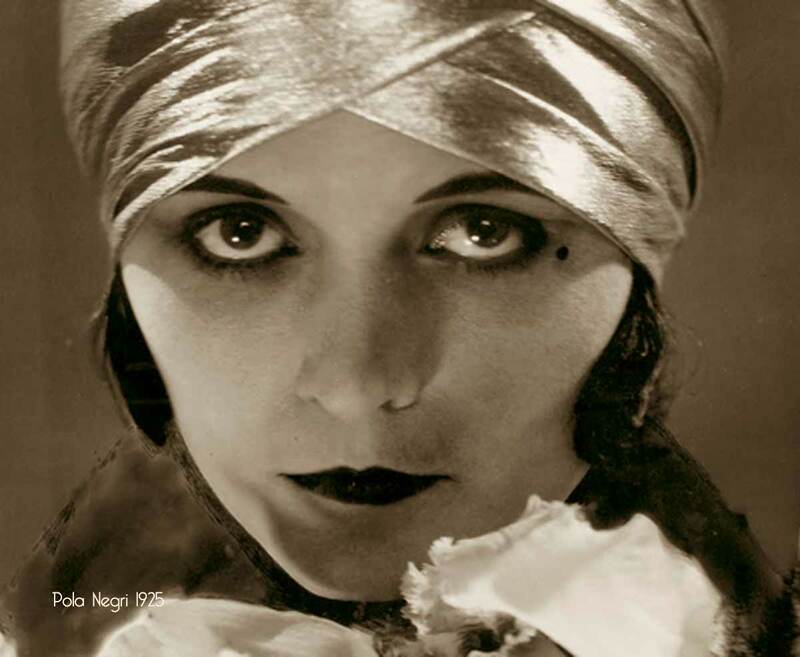 These days she is a Pola Negri type ! Her face is like a sample case representing the very latest in cosmetics. Not so long ago it was fashionable to use brown powder, to affect the Egyptian bronze look. 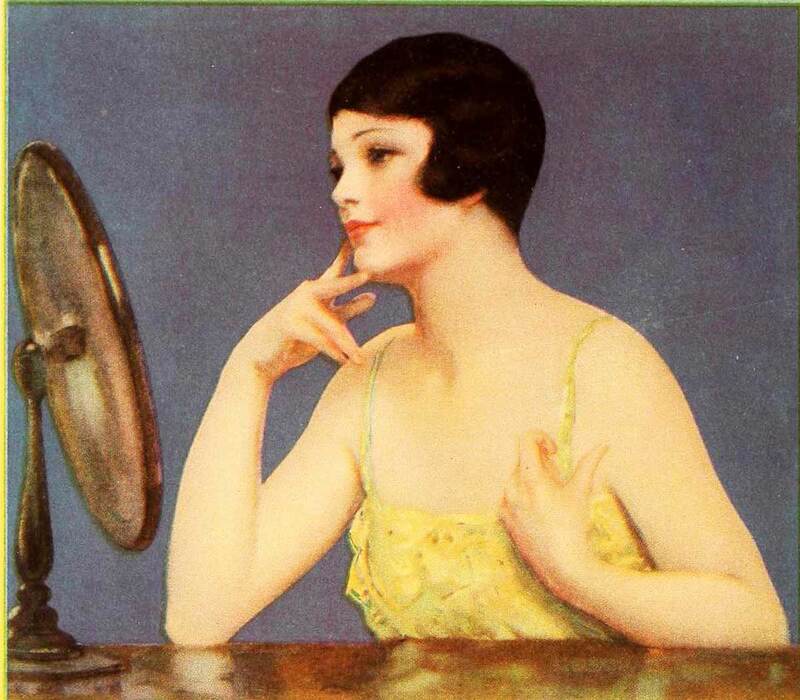 Before the rest of us knew that this mode was passée, she appeared with a complexions as pale and lovely as Alice Joyce. “If Hollywood actresses can change their hair and makeup as often as their clothes, then why can’t I?” she reasoned to me recently. Greta Nissen’s many movie looks have audiences straining to recognise her sometimes, as you can see with these three screen shots – all taken this year. So, if an actress makes up for different roles, why shouldn’t you? But mix your powders with intelligence, apply your rouge with brain. And let your make-up look like the faint touch of the hand of nature ! Fantastic post! I always enjoy your article about the Twenties, they are so in-depth and accurate.